The Kishu Ken is one of 6 Japanese Spitz-type dogs and was bred by hunters of present day Wakayama to hunt large game such as deer and wild boar. They are considered national treasures in Japan and are prized for being clean, dignified, intelligent, loyal and alert. Rarely found outside Japan, they are now mostly companion dogs and are suitable for most owners as long as they have the ability to give them varied daily outdoor exercise. Although they are bright, they are independent thinkers and will not only need variation in exercise, but also training; toys, food, and hunting games are great motivators. They are playful, loyal friends to kids they are raised with. With strangers they are aloof, however, they rarely bark and do not make appropriate guard dogs. Kishus retain hunting instincts, especially towards smaller pets, even if raised with them. Members of this breed are low maintenance in regards to grooming, but do shed (and heavily twice per year). Overall, they are a healthy breed with few serious health issues documented; with good fortune they should live 11-13 years. Below are details and specs for the Kishu Ken dog breed. This medium sized dog will reach around 18-21 inches at the shoulder and weigh 30-50 pounds depending upon the gender. The Kishu Ken can be ok with other pets if raised with them from a young age but will still possess a strong prey drive towards smaller animals. They are also playful and loyal companions to children that they are brought up around. Strangers may find the Kishu aloof but they do not make good guard dogs due to non-aggressive nature and tendency to not bark. Kishus are low maintenance in regards to grooming and moderate maintenance when it comes to exercise and training. They are smart but independent, and they may become bored if the routine does not vary. Members of this breed are considered working dogs that were used to hunt boar and deer. Their ancestors date back 3,000 years and the Kishu breed, itself, predates the Shiba Inu and Akita breeds (there are 6 total Spitz-type Japanese dogs). Paintings dating back 700 years depict the Kishu Ken's importance to the hunter. In the past their coats were many colors, but due to preferential breeding the white is now most common because it is easier to see by the hunter and, in general, appears more clean. The development of these Japanese mountain dogs is attributed to the present day Wakayama region (previously Kishu) and in 1934 Japan had officially made these dogs national treasures. Little changed these dogs over time, not even the World Wars that ravaged other breeds, due to protected mountain origins. Presently, members of this breed are kept as companion dogs and are recognized by NIPPO, FCI, UKC and others. 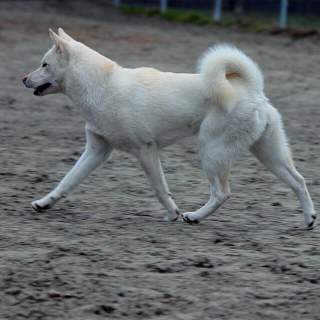 The Kishu Ken was recorded in the Foundation Stock Service since 2005 and, although not yet AKC recognized, was allowed to compete in companion events as of 2008. The Kishu Ken appears clean, dignified and, most importantly, alert. They are strong with compact bodies that are nearly as tall as they are long. The coat consists of a dense, soft underlayer and short, straight outer layer that is coarse to the touch; the standard states the coat will be longer on the face and tail. At present, the most common coloration is white but they can also be red or "red sesame". The Kishu's ears will be small, erect and triangular and they will have triangular dark brown eyes with lids that appear slightly slanted. Noses are typically black but can often be "flesh-colored" in white dogs. They have a thick, somewhat long tail that is carried curled or sickle shaped. The coat of the Kishu Ken is either white, red, or "red sesame" that looks akin to a fox coat (red and fawn with black tips). By 1945 most additional colors, including multi-colored coats, had been preferentially bred out and now they are most commonly seen in solid white. This is considered a medium sized breed and are nearly as tall as long. Males are around 20.5 inches and females 18 inches at the shoulder. There is no weight dictated by either NIPPO or FCI, however, the breed is said to look well-muscled and kishu-ken.org states to expect them to reach 30-50 pounds. These dogs are often described as spirited and alert, they were bred for hunting large game so they have plenty of prey drive along with playful energy that needs to be expended daily. Kishus are silent, for the most part, and this gives them an air of being thoughtful and intelligent. They are clean, faithful, and hunters Most owners agree that the Kishu Ken does fine spending reasonable amounts of time alone. Training is not for the faint-hearted as the Kishu is intelligent yet independent. Typically, they are motivated best when working for a treat they like, a toy, or activities they naturally might pursue such as hunting and coursing. Members of this breed are loving and playful with children but should be raised with them from an early age. They may view children they don't know as small animals and, therefore, may decide to investigate or even chase them. A Kishu Ken is not the best choice for a household with multiple pets. They can adapt to this environment if raised with them from puppy age, but they retain strong prey drives and hunting instincts. Kishus will likely be aloof towards strangers, however, they are said to be more approachable than other Japanese dog breeds. They are not the correct choice for those seeking a dog for protection. Below are pictures and images of the Kishu Ken. Overall, this is a low-moderate maintenance breed. They need daily exercise that varies from time to time so they don't become bored. They are intelligent, independent thinkers that are trained best when motivated by treats and toys. Grooming, however, will require little more than a weekly brushing to keep their coat in good shape. 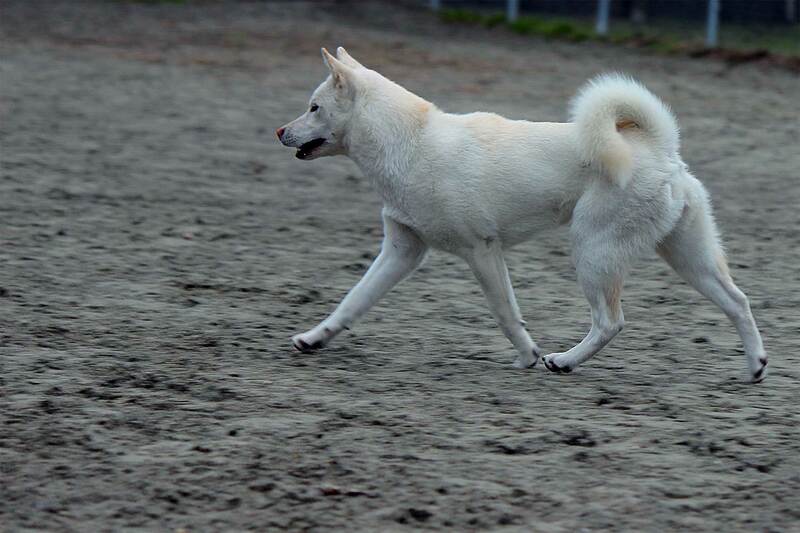 The Kishu is a low maintenance breed that generally appears clean. They are shedders and will do so heavily about twice per year. Weekly coat brushing is recommended to reduce shed and prevents matting of the hair; this needs to be done more frequently during heavy shed times. Bathe them when they appear dirty or smell, clean the teeth and ears regularly as well as trim the nails when they appear long (do so immediately if you hear them clicking on the floor or concrete). Members of this breed need daily exercise and will be happy to attend your own activities if you are an active person that goes walking, hiking, running, etc. 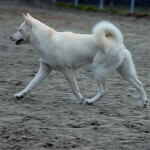 Kishu-ken.org suggest you alternate their exercise routine, however, as they may get bored with a daily walk routine. Giving them toys, obedience and agility training, taking them on hikes, as well as playing hunting games will help prevent possible bored behavior. Kishus need a nice fenced yard to play and exercise their hunting instincts. There is no evidence to suggest they are not adaptable to both indoor and outdoor living. They will likely be docile indoor companions and playful and energetic outdoors. It is important to note that they are said to not do well when kenneled (this may be important if you must leave them for more than a day). There are no documented temperature restrictions for this breed. If you live in an extreme climate that you feel may be a concern for your Kishu, try researching the native climate (Wakayama Region, Japan). As a rare breed, there is a lack of information regarding health issues of the Kishu Ken. Severe skin allergies and entropion (inward curling) eyelids are not uncommon. Occasionally, thyroid disease, Addison's Disease. epilepsy and gastro intestinal issues have also been recorded. Overall, this Japanese breed is very healthy and will likely live 11-13 years.